No experience needed! Come ready to play in clothes you can move in. Find connection with other seniors in East Harlem through rigorous movement and community reflection about staying physical, finding boundaries and building community. What: This idea is in process as we transition out of the Su Casa Resident program to hopefully another relationship with East Harlem Seniors! When: Some weekend afternoon at the end of July or beginning of August. please rsvp if you are interested! LOCATION: Highline at the 23rd street entrance to where there is a green grass lawn! We will perform 10-minute performances that enter and exit this space in collaboration with the Brandon Project a local youth-based group. Second Seasonal Immersion in Parcon will consist of Parcon orientation, all ages jam with Parcon Generation, mixed abilities dancers, community meals, and stick work, contact improv jams, and advanced parcon. Parcon will return to Canada during the Ontario Contact Improvisation Jam, the largest jam in North America! Our bodies and movement, as well as the spaces we occupy, are political. Parcon is a site-specific contact dance form made by and for people of color, intersecting marginalized identities and their allies. We use touch, shared momentum and anti-oppressive practice to challenge and transform the status quo. 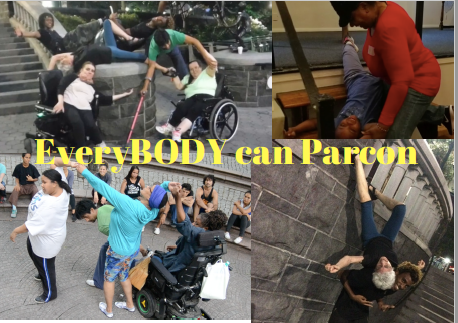 The two main movement forms to inspire Parcon are Parkour- an urban obstacle course running form that prioritizes flow and efficiency and Contact Improvisation- our leaning empathetic dialogue that we share on the dance floor. In this workshop we will play with ways that we perform race and class in public spaces through the practice of Parcon and collective reflection. No experience is needed! We will explore an afternoon practicing Parcon in various sites in East Harlem including the Jefferson Playground, Duke Ellington Circle, and Central Park. Alternative plans for rain are a walking tour together through the Subway system around the City Hall area. No experience needed. Please wear clothes that you feel comfortable getting dirty and physical in. Please bring snacks and water as needed and hand sanitizer and/or wipes. The Black Panther Women is a necessary life-anchoring show that everyone must see, especially black and brown young adults. It tells the herstory of the Black Panther Party and is powerfully acted by an amazing cast of women! I will be hosting a Total Play for Empowerment movement workshop on March 3rd as a fundraiser for both the Women of Color Productions and Parcon teachers. If you have not experienced the liberation of Parcon yet, this is an amazing opportunity to interweave your embodiment with collective reflection on social issues. It is powerful movement and empathy work and it complements the theater piece well. See below for ticket link or please call 646-757-3209 to reserve your spot! Email andrew@parconnyc.com if you want to learn more or would like to come but finances are difficult!